One of my favorite types of architecture is the old movie palace era (1910s thru the 1940s). During this period the smallest theaters in the smallest towns were works of art. These old theaters are a dying breed, and there aren’t many left. 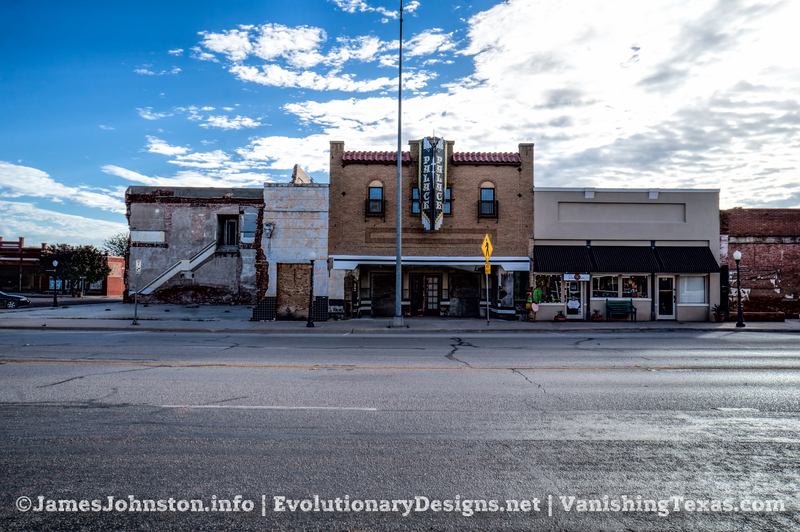 Many of them have been demolished, sit vacant, or are now re purposed stores and offices buildings. Of those that still exist, most have been remodeled, refaced, and updated to keep up with the times. 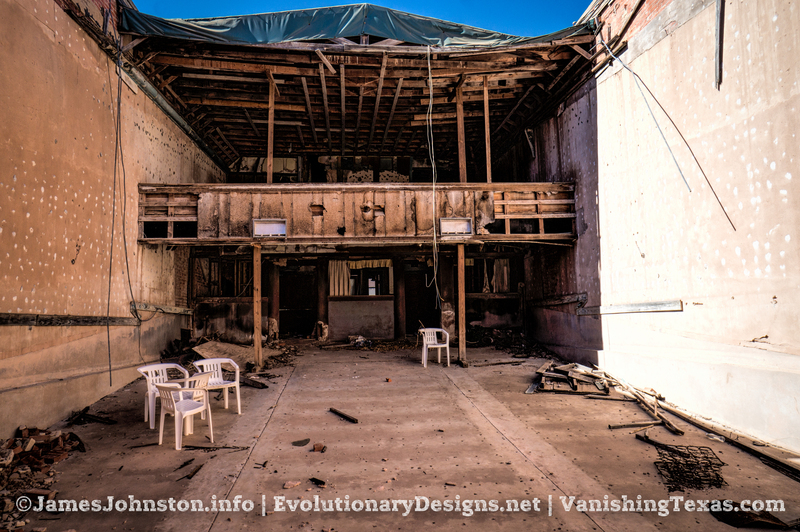 Today’s Vanishing Texas article is about the Abandoned Palace Theater in Anson, Texas. The Palace Theater in Anson, Texas is on HWY-83 in Downtown next door to a gutted collapsed building (already cleaned up) next door. As you drive into the center of town, you can’t miss it. I searched the internet for several months as to the history of the Palace, but I can’t seem to find any information. 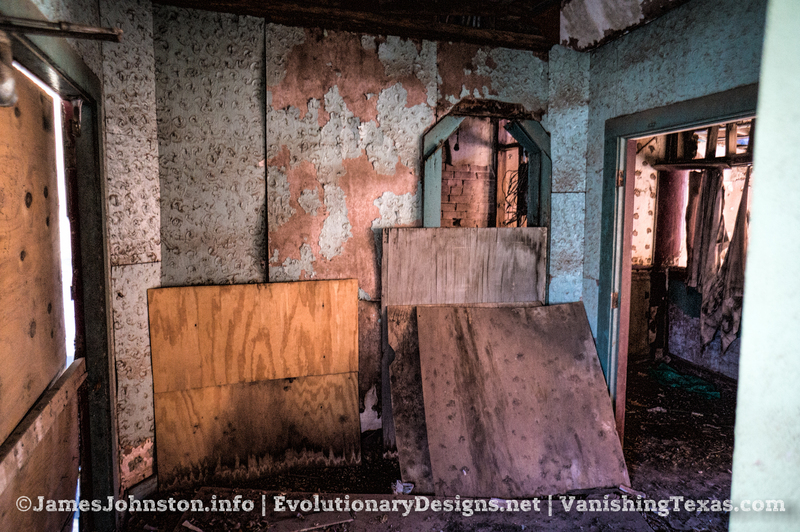 I have spoken with a few of the locals and all they know is that its been abandoned for decades. What I do know is that a fire in 1904 burned the Maxewell House which was the first building to sit at the current location of the Palace Theater and several other buildings. The design of the theater is of the movie palace era. But the theater is on the plain side of what most movie palaces of the era theaters looked like, it did have the Spanish style red tiles and a fancy marquee sign that would light up the street as you came into downtown. The movie palace era started in the 1910s and ended sometime in the 1940s. Since the 1904 fire destroyed a large portion of Anson, it might have taken time for the area to be cleared, sold and built back up. With that in mind, it is reasonable to think the theater was built sometime in that era. Back in 2014 I had the chance to explore the Palace Theater one early afternoon. I had spoken with several people from town and they said that if it was open, I could go in, but the place was gutted and missing its roof. Wasn’t much left to document. I got to the front doors and they were actually unlocked and the doors were slightly ajar. I opened the doors as a few people walked by. They smiled and waved, so I walked right on in. The first thing I noticed was the severe amount decay in the lobby. The stairs leading up to the balcony are sketchy and saggy in between the supports. The projection room is filthy with mold on the walls. The old projection equipment is gone, the balcony seats are gone except for a broken few, and wholes in the floors. As you step past the lobby and into where the theater should be, its completely gutted and the roof is gone. There is still some roof debris on the concrete slab and what’s left of the roof and other stuff from the old theater days has been pushed back. At least the lobby’s roof has a tarp thrown over it. From what I’ve heard the roof clasped after a major storm over a decade ago and the owners where approved or applied for a grant to get it fixed. But evidence shows that nothing has happened so far. The Marquee was recently restored maybe in the last decade and the kiosk was removed. Someone said it was stored in the lobby. But I couldn’t find it. If you know anything about this old theater, please contact us. I can not find any information about the place. I am looking for a build date, open date, closure date, if it changed hands, who the current owner is, vintage photos of the theater, and what the future plans are for the place. One of my of my photographer friends visited Anson less than a year ago and he says it looks like renovations have started on the old theater. If anyone has details on this please contact us. We would love to have the details on what the plans for the old theater is and added them to this article. Note: The pictures were taken in November of 2014 and this article was originally posted to VanishingTexas.com on April 2nd, 2016. VanishingTexas.com is no longer affiliated with us. All content from that site is slowly being migrated and updated to this site. This article was updated on march 28rd, 2019 and will continue to be updated as new information is found. The images were shot by hand in the middle of the afternoon with my Sony Nex-3N and a Sony SEL16F28 16mm f/2.8. I then edited the images in Adobe Lightroom. Next, I post processed with Topaz Clarity to add texture, brighten, and bring out the details in the images. Then I removed the dust spots. Finally, I used Topaz DeNoise to remove the noise from the images. Hi! My name is James and I am professional photographer living in rural North Texas. I love the outdoors. I spend my free time exploring rural and abandoned Texas. I am available for photography work. I do travel photography, including national and state parks reviews with images of the parks. I also photograph farm/ranch life including livestock and farmers/ranchers at work. If I am not doing landscape work, I'm at a car shows and offroad parks taking pictures. If you are needing a photographer to document your car shows, offroad adventures or get together, I'm your guy! Please contact me for details.